From 8 April to 11 October in 2005, hydrological observation of the Rongbuk Glacier catchment was carried out in the Mt. Qomolangma (Everest) region in the central Himalayas, China. 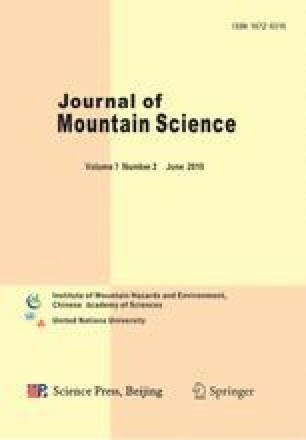 The results demonstrated that due to its large area with glacier lakes at the tongue of the Rongbuk Glacier, a large amount of stream flow was found at night, which indicates the strong storage characteristic of the Rongbuk Glacier catchment. There was a time lag ranging from 8 to 14 hours between daily discharge peaks and maximum melting (maximum temperature). As melting went on the time lag got shorter. A high correlation was found between the hydrological process and daily temperature during the ablation period. The runoff from April to October was about 80% of the total in the observation period. Compared with the discharge data in 1959, the runoff in 2005 was much more, and the runoff in June, July and August increased by 69%, 35% and 14%, respectively. The rising of temperature is a major factor causing the increase in runoff. The discharges from precipitation and snow and ice melting are separated. The discharge induced by precipitation accounts for about 20% of the total runoff, while snow and ice melting for about 80%.